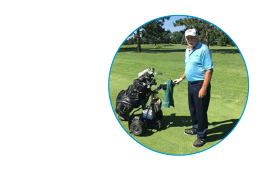 At the age of 73, golf enthusiast Bill C. was diagnosed with bronchiectasis after experiencing shortness of breath and a near-constant, problematic cough. “The cough was so deep that my stomach muscles were sore all of the time and I avoided most social situations for fear of embarrassment. I wouldn’t attend plays or movies, or anywhere that is quiet with a crowd,” Bill said. Wasting no time, Bill decided to move forward. “My doctor sent a prescription to RespirTech, and in a few days a representative brought the inCourage Comfort Vest to my home and spent about an hour showing me how to use it. I started feeling results at the start of the third week and from then on my life really started to improve,” he said. Bill’s experience with RespirTech’s customer service went far beyond initial training as he settled into routine with the inCourage System. “The Customer Care team communicated with me often, asking how things were going and answering my questions. I started a routine of using the vest before breakfast while reading the news for 30 minutes, then in the evening before dinner, the same thing. I just put the vest on, push a button, and let it work while I read,” he said.